Bachelor Mother is another one of those great time-capsule movies that communicates much more to a modern viewer than just its plot. It’s a light, charming comedy from 1939, starring Ginger Rogers, and pretty much right from the start, the concept of the situation completely and utterly reflects its era. Rogers plays a shopgirl at Merlin’s department store (in the novelty duck toy division), who has just been informed that her job will end immediately after the Christmas shopping season is over. As an enterprising young woman, she unsuccessfully spends her lunch hour at an employment office to arrange for future work, but, upon exiting, discovers that someone has left a baby on the steps outside an orphanage nearby. When she brings him inside, the staff immediately assume that the baby boy is hers and that she has come to abandon him, despite her repeated protestations that the child is not hers. After she leaves, the staff infer that she must have partly made her decision based on the fact that she’ll soon be losing her job, so they approach her boss, David Merlin, who arranges for her to get her job back at the store. Spanish poster for Bachelor Mother that accurately captures the baby’s sinister nature. At no point does anyone–the orphanage staff, her boss, her landlord, anyone–believe her when she says the child is not hers, despite the fact that nobody saw her pregnant or has any evidence more compelling than the fact that the baby doesn’t cry when she holds it. In fact, when she tells the staff at the orphanage that it’s not her baby, they cunningly point out that “that’s just what somebody who was abandoning their baby would say,” and so the matter is considered settled, thanks to their superior logic and a lack of DNA testing. So, although it’s a comedy, it can also be fairly frustrating to watch at times–because it doesn’t always seem like a particularly comedic situation. With the baby back in her custody (and her boss, Merlin, threatening to fire her if she tries to give him up again), Poppy attempts to retain her single gal lifestyle, but finds it quite crimped by the presence of the tiny tot. When a date shows up to her door, she tries to hide the baby and claims that she can’t go out because “a little something’s come up.” After some discussion though, she becomes determined not to let the baby cause her any more trouble, and, bolstered by the promise of a $50 cash prize for second place in a dance contest, she has her date stop at Mr. Merlin’s house to drop the baby off, since “he’s the one who got her into this mess.” That statement is, of course, immediately misconstrued by multiple people. At the dance hall, Merlin attempts to chase her down, but his moves aren’t quite as impressive as Poppy’s, and he is quickly shuffled off the dance floor before he can confront her. By the way, Poppy’s date soon discovers that, if you’re specifically trying to win second place, you probably shouldn’t choose Ginger Rogers as your dance partner. They win first place–“of all the tough breaks”–and a trophy, instead of the consolation cash prize for second. As Mr. Merlin is chasing her around town trying to make sure she keeps the baby, they gradually kind of fall in love. I especially like at a New Year’s Eve party they attend together, where she doesn’t know anyone, and they conspire to have her pretend to speak only Swedish, so that it won’t seem odd that Merlin doesn’t leave her side. As they’re leaving, Merlin’s catty former ladyfriend (who was supposed to have been his date to the party, but stood him up) remarks that Poppy didn’t look too bad… for a fill-in. Poppy immediately snaps back, in English: “Oh, I’d just as soon go stag. You could too, with those shoulders,” and walks out confidently with the man on her arm, leaving the other woman in shock. This was Ginger’s first role after the end of her main partnership with Fred Astaire (until their later Barkleys of Broadway project in 1949), and I can certainly see why she became a star on her right based on films like this. The comedy in this movie really plays on her naïveté to start, but I like her transformation into a more confident woman by the film’s end. It’s kind of an odd ending, where, still, nobody believes her about the baby, but she just sort of rolls with it. Given the context of the rest of the movie, I suppose that is the happiest ending she could get out of the situation. Despite the dated concept, I think the film (and particulalry, the comedy of the film) holds up really well. For a modern comparison, it does remind me a bit of the 2010 movie, Easy A, in that the film throws a “good girl” into a “bad girl” situation without compromising her innocence. In both cases, it’s interesting to think about why, culturally, they didn’t just make a movie about a woman who’s actually in that situation, instead of dancing around the issue by choosing to focus on the poor, mistaken good girl instead. 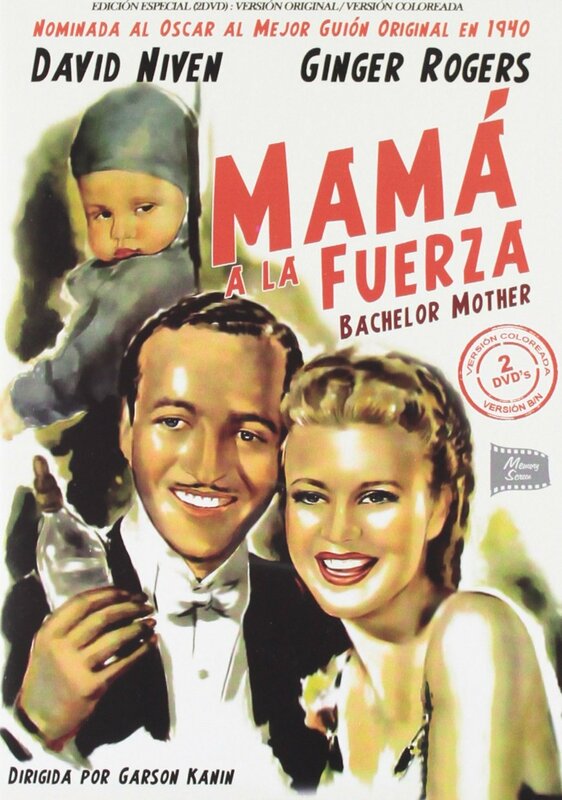 Coincidentally, TCM aired Bachelor Mother just a few days before it was added to Warner Archive Instant’s roster, which means I was accidentally prepared to cover this new release. TCM also aired the Debbie Reynolds musical remake, Bundle of Joy, which was already on Warner Archive Instant, and was one of the first titles I got to delete from my DVR since I knew I’d now have easy access to it. So, look for that one coming up soon!